Subjects will be as they used to be for Photo of the Day - historic or modern images of interest to fans of the D&RGW. That can be everything from scans of old negatives in my collection of narrow gauge steamers pulling freight to things like this week's - Union Pacific's MRONY working east through a snowy Utah desert near Thompson. If you're interested, take a look [here]. The Colorado House Capital Development Committee made the decision Tuesday to allocate $1M towards the C&TS's track program for the coming season. At least some of the funding will come from the State Fiscal Stabilization Fund of Colorado's American Recovery & Reinvestment Act - aka federal stimulus - dollars. This will be matched by New Mexico, so we'll get a total of $2M for track next year. From the Colorado summary of the request, the funds will be used to "purchase and install 8,000 crossties; 24,000 tons of rock ballast; 288 barrels of spikes; 6,000 tie plates; 64,000 rail anchors; bridge and shoulder restoration; along with fuel, parts, supplies and labor to accomplish the work." Later in the request it states that this will provide 18 jobs, provide for tamping and aligning 32 miles of track, and perform some bridge repairs as well. The Pueblo Chieftain article announcing the proposed appropriation can be found [here]. More details can be found in the Colorado capital construction request worksheet, which I've mirrored [here]. For those wondering about the history of funding for the track project, here you go. Note that operating subsidy funds are not included - this is capital improvement money only. [this map], on the west side of the Wellington Road / Main Street intersection. The site, costing the town an expected $192,000, will remove twenty parking spaces and replace them with a metal shelter for the locomotive. The town expects the Colorado Historical Society to deliver #9 around April, and its new home is expected to be completed by summer. 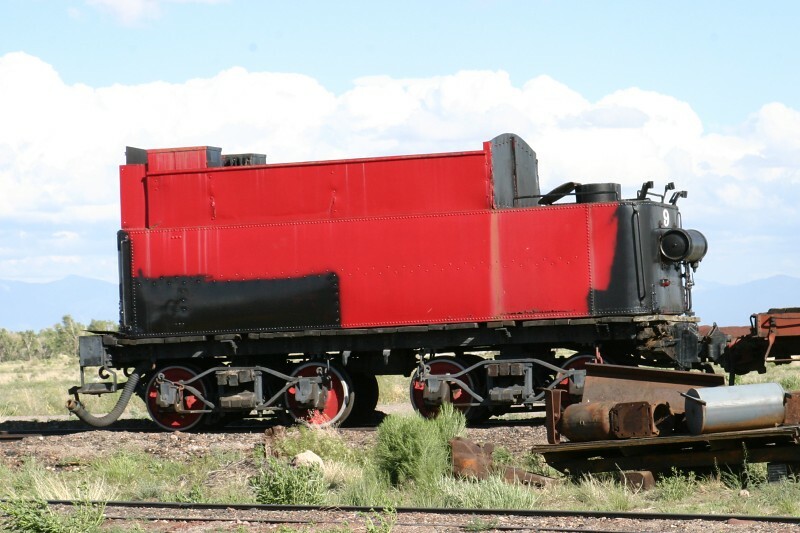 When I was out in western Colorado and Utah two weeks ago, I stopped over in Palisade to check on #9's restoration. I've posted a few photos of the engine from Sunday, 10-Jan-2010 in the news gallery [here]. Update (24-Jan-2010 1626h): I've gotten a couple questions now, both backchannel and via NGDF, about #9's tender. First of all, no, the restoration of the tender was not included in Braun's contract to restore #9. With that said, let's cover the short version of the sad and winding story of CHS failures with various tenders. 9's tender first went to Antonito, CO, in early 2004 for work, as all of 9 was supposed to go there for rebuilding. 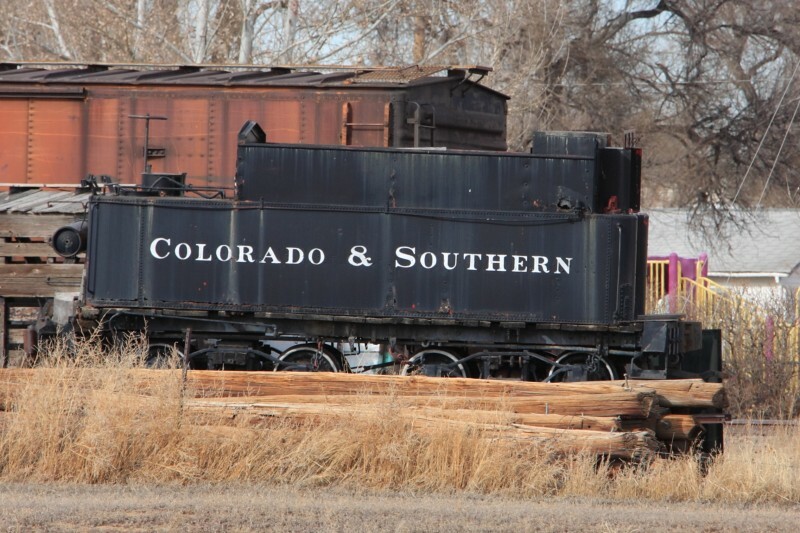 Shortly after getting the tender and before accepting the locomotive itself, the C&TS shop stopped work after finding asbestos insulating wrap on some of the tender piping. See [here] for a photo of it taken on 29-May-2004 sitting in the Antonito yard. The tender was then sent to Uhrich Locomotive Works in Strasburg, CO. The CHS was deperate to find some combination of steam power that could run on the Loop. Evaluations on 9's tender showed that it as in too poor shape to be used (or at least restored in time), so Denver, Boulder & Western #30's tender was converted to hold oil for 9 instead. That's the tender it had while running on the Loop. Given that 9 has now been out of the picture for several years and work for the CHS out at Uhrich's has stopped, there was some question as to where 9's real tender wound up. I drove up there this afternoon and confirmed that yes, it and IRCA 111's tenders are still there, and little if anything visible has been done to either. 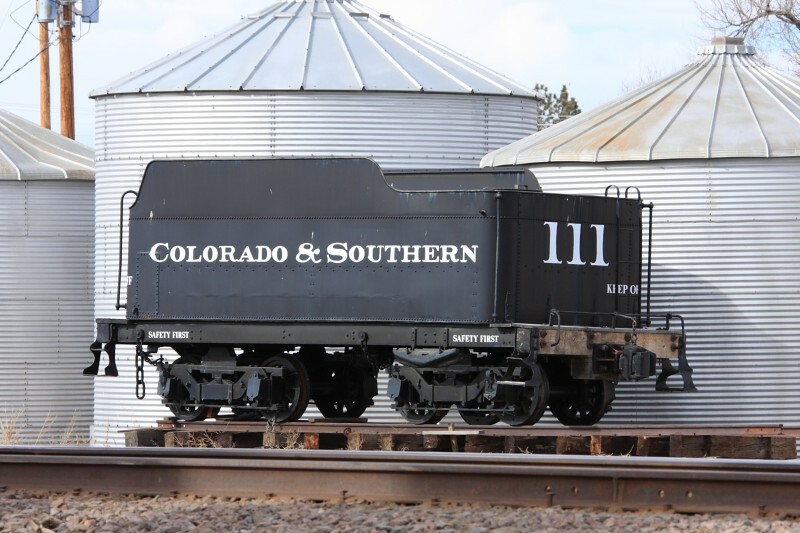 [Here's] a picture of C&S #9's tender, and [here's] the one off IRCA 111 from Breckenridge. It seems to me that the CHS just continues to leave a wake of disasters and destruction. 30/74 is not supposed to be back together until 2018 (per reports on NGDF) at Boulder's request, due to a [lawsuit against Uhrich over some allegedly missing parts] and budget constraints. 9's tender sits forlorn and rusting while the engine has been beautifully restored, and Breck's old 111 is in pieces. I'm sure Breckenridge will notice that there doesn't seem to be a tender to go with their shiny new engine. It'll be interesting to see what the CHS tries to give Breck for a tender - 111's tender or 30/74's tender? 9's certainly is in no shape to go on display, and I suspect Boulder will be less than thrilled with 30/74's tender going to yet another temporary home. Xcel Energy has started construction on a new rail spur from the Craig Branch south to its Hayden Generating Station, just east of Hayden, CO.
For those unfamiliar with the Hayden Generating Station, it's a two unit, coal-fired electric generation plant sited just to the south of US 40 and east of its namesake town. Construction on the first unit was started in 1962, and it was made operational in 1965. The second unit was added in 1973 and placed online in 1976. Together, the two units are capable of producing 446 megawatts of power. The plant is jointly owned by PacifiCorp, the Salt River Project, and Xcel Energy (through its subsidiary, Public Service Company of Colorado). Xcel/PSC is responsible for day-to-day operations at the facility. Until late 2005, Hayden was fueled from Peabody Energy's neighboring Seneca Mine. With the closure of Seneca late in that year, the plant began trucking coal up from Twentymile, another Peabody property located a few miles south on Routt County Road 27, at the end of the former D&RGW (now Union Pacific) Energy Branch. The plant consumes 1.8 million tons of coal per year, hauled continuously over Routt CR-27 in 25 ton truckloads. Estimates are that deposits that can be extracted by longwall mining at Twentymile will run out around 2013. With the looming end of the plant's current fuel supply, Xcel/PSC started the process of re-establishing rail access to the facility in mid-2005. Construction on the new spur started in September 2009, and is expected to be complete in 2012. The new spur should pay for itself easily. The Public Utilities Commision filing indicates that Xcel/PSC expects the cost savings by switching to rail from truck haulage to be in the neighborhood of $193M over the 26 years between the end of spur construction and the end of plant operation in 2037. A number of routes were considered, but the final plan will take it along nearly the same course as the plant's original spur, torn up at some point in the past. Coming off the Craig Branch eastward at around milepost 209.8, the line will curve around to the south before crossing US Highway 40, and the continue curving southwest to cross Routt County Hwy 27 and enter the plant property. An overview drawing from Xcel/PSC can be found here. I've had this trip report just oh so close to being ready to post since late December, but with the holidays and travel, I never quite got it finished. Given that I'm taking today off (wasn't ready to go back to work yet), I thought I'd just get this wrapped up and published this morning. The original intention was to go to Chama on Friday, 4-Dec-2009 to photograph the plow special. However, that wound up not running, but we still had hotel reservations we couldn't cancel. So, we figured we'd just head over to Durango for the day, and then double back to Chama to shoot the two Christmas Trains the next day.